I could gush about Wool Studio Vol. 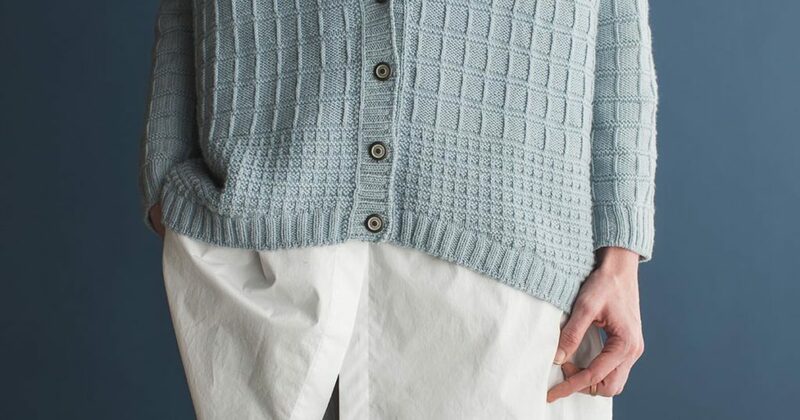 4 endlessly, but one pattern in the collection has truly captured my heart: the Maya Cardigan. The drape is stunning, the textured squares are unique, and the cardigan looks so cozy I can see myself refusing to ever take it off. 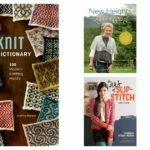 If you haven’t heard of Norah Gaughan, the designer behind Wool Studio Vol. 4, you need to check her out. She’s the queen of cables and a garment-design savant. She seamlessly blends the familiar and the edgy, creating comforting garments that make a statement. 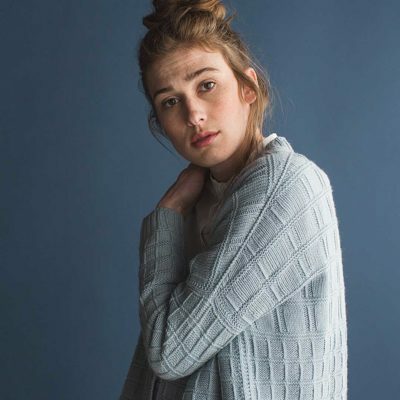 And with the Maya Cardigan, she’s figured out how to add structure to a slouchy cardigan—something I honestly didn’t think was possible—creating a sweater you can lounge around the house in or wear to the office. Plus, with its seamless construction and textural square pattern, this piece is sure to offer some truly intriguing knitting. 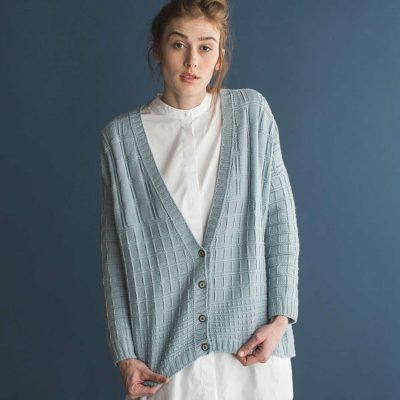 I love the cardigan, but I could also see myself making an awesome pillow or scarf out of the textured square pattern—its possibilities seem almost endless. And the majority of Norah’s patterns are this way. Check out the lookbook to see what I’m talking about. Finished Size 44¾ (52¼, 59½, 67, 74½)” bust circumference, buttoned. Cardigan shown measures 52¼”; modeled with 16¼” of positive ease. Yarn Jagger Spun The Green Line (100% organic merino wool; 166 yd [152 m]/1¾ oz [50 g]): pebble, 11 (14, 16, 19, 22) skeins. Needles Sizes 2 (2.75 mm) and 3 (3.25 mm): 32″ circular (cir) and set of double-pointed (dpn). Adjust needle size if necessary to obtain the correct gauge. Notions Markers (m); removable m; stitch holders; spare 32″ cir needle in size 2 (2.75 mm) or smaller; tapestry needle; 4 (4, 4, 5, 5) 11/16″ buttons. Gauge 26 sts and 39 rows = 4″ in Medium Square patt on larger needle; 26 sts and 36 rows = 4″ in Large Square patt on larger needle; 26 sts and 45 rows = 4″ in Small Square patt on larger needle. Are you enamored of the Maya Cardigan like me, or has some other design caught your eye? Let me know in the comments!